Like The Accidental Locavore, everyone has had those moments in the kitchen when you just shake your head and wonder, “who invented this?” Or as is often the case for me, “what man who has never washed a dish in his life created this impossible-to-clean appliance?” It’s what almost drove me to become an industrial designer back in the day. Thanks to a new company, GIR (Get it Right), you won’t be saying that about an ordinary kitchen tool—the spatula. As their press release states: “We noticed that a lot of the kitchen spatulas currently available in stores have major design defects. 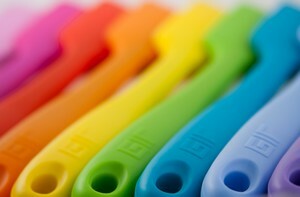 Even spatulas with a quality silicone blade will often have plastic or wooden handles that burn on the stove or get brittle over time.” What they don’t mention is that the blades often also get brittle or chewed up over time, limiting their usefulness. The other issue with any utensil is that if you’re using non-stick pans, metal (which is what a lot of tools are made of) will scratch the surface. A few weeks ago GIR sent the Locavore a handsome green spatula to play around with. Since I was hanging in California for a while (and didn’t see the need to take the spatula on a long flight) it was just this past week that I actually faced a stove, spatula in hand. My first reaction was that it seemed awfully heavy. Not that anyone is going to be using it constantly, where weight would become an issue. It also seemed stiffer that the rest of the spatulas I have. The shape was pretty familiar and the colors it comes in are great! First test: Scrambled eggs. 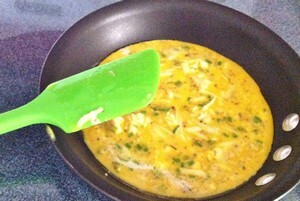 I always use a spatula to quietly move the eggs around the pan. For the small pan I was using, this was a little big and unwieldy, but it could be just that I’m used to using a small spatula in this case. Not overwhelmed, but had no qualms about resting the handle against the pan while I took its picture. Next up: Scraping out the food processor. This was where my feeling about the GIR spatula started to change. Boy, does it do a great job, getting every last bit! I’m not sure why (silicone? 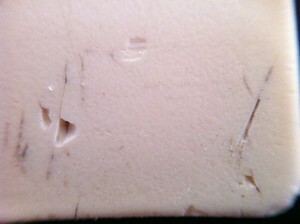 ), but it really grabs onto the surface and even gets the corners of the work bowl cleaner than normal. Same for scraping out plastic storage containers. Finally: Pushing Brussels sprouts around a very hot (450°) pan to get them properly roasted. Worked as well as the wooden spatula I would normally use, but with a big difference—MUCH easier to clean! Washes up so fast, that I haven’t actually put it through the dishwasher yet…too attached to it to wait for the machine to do its thing. Do you think I could trade in my OXO Good Grips spatulas for a red GIR for the country house? Can’t wait for GIR to start producing a smaller version for jars and my little scrambled egg pan! Updates: Price for the regular spatula is now $12.95 and there is a smaller version (the mini) which I use at least once a day! 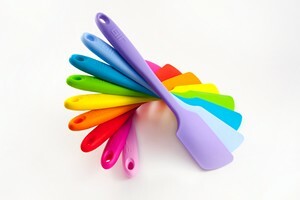 Thanks to Aja at GIR for the spatula and the photos of all the colors!